My 11 year old daughter has been working on a research project on mangroves. Some of your videos has allowed her to grow her knowledge and form an opinion. She made a poster, created a display at her school library, wrote a 800 word report and made a video. She’s 11 years old and it’s her 1st ever big assignment. She’s the only one selected in her school - she’s not an "straight-A" student, however, she’s academic in thought and always getting interested and excited in learning new things. When it was all due, she had only started 10 days ago with brainstorming a topic. I did a call out on my FB for ideas from friends. A teacher friend called her encouraging her to look into mangroves. 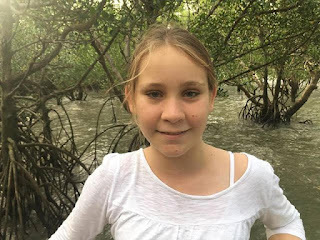 Anais thought it was a good idea and then began to become extremely interested the more she learned, the more she spoke to people and the more she visited a local mangrove boardwalk. Anais won the contest with her entry. 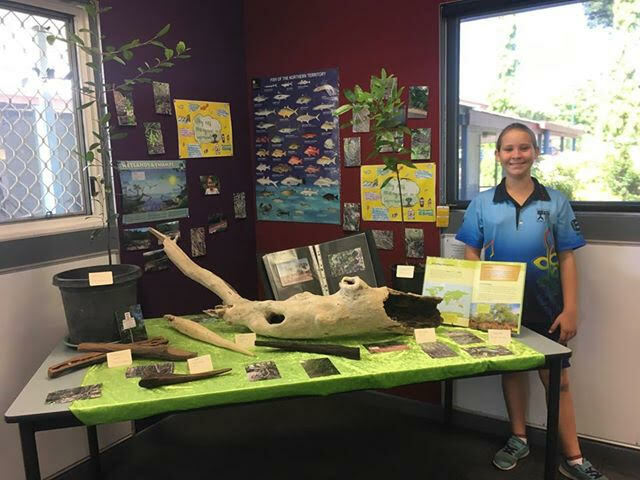 She was presented with her acknowledgement at school and will be presented the actual award and $500 prize in February in the Northern Territory Parliament by the Minister of Education. EDITOR'S NOTE - Anais gets an A+ from Mangrove Action Project. Great job, and we hope you will continue to work towards being a solution to the planets illnesses and help preserve it's delicate ecosystems. As a Thank You for your hard work, we are hereby proclaiming you to be MAPs first ever HonoraryJunior Ambassador. - GOOD JOB ANAIS! Please click here to see the video and read the complete text of her report that follows. To do this research I spoke to knowledgeable people, I read scientific books, I watched documentaries and I also went into mangroves multiple times to discover them for myself. My research proves that mangroves are necessary to our environment as they provide a habitat for animals, they are a natural barrier against cyclones and tsunamis, they protect sediment from going into coral reefs and protect from costal erosion. Mangrove forests are used by local Aboriginal people to get bush tucker and bush medicine for them, their family and friends. Mangrove forests can provide a sustainable economy and can be used as a food source. Mangrove tours for everyone in or around the mangrove forests can be offered by Darwin City Council, Northern Territory Parks and Wildlife and local Aboriginal people. The big fishing companies should support the protection of mangroves as they need the fish and prawns to grow their business and earn more profits. Mangroves are incredible plants with many different species that are very important to the coastal ecosystem. They have the ability to survive in both freshwater and saltwater, making them truly amazing plants. The reason they are so important is because they help us in a range of different ways. Mangrove forest provide a habitat and a nursery for fish such as barramundi and prawns. This means that fish can have a safe place to live away from predators and grow. There is not much light in the water surrounding the mangroves making it dark because of the canopy which gives fish a better chance to get away from possible predators eating them, without being seen. There are a lot of nutrients in the silty water which is very good for the baby fish in the nurseries. I went on a mangrove forest research walk in the day and in the night. The differences were that in the day there were no bats, there were less varieties of birds calling/responding and there were no hermit crabs. At night there were billions of hermit crabs, so many different birds calling/responding that I had no idea what to listen to and there were many bats flying across the night sky. Mangrove forests are a natural barrier that slow down cyclones and tsunamis along with other natural disasters because they act like a wall against destructive winds of cyclones and tall rapid waves of tsunamis. Mangrove forests also stop sediment from going into coral reefs. Sediment is soil from land and rivers which is different to the sea bed. Mangrove forests prevent coastal erosion by holding everything together, slowing down waves and preventing humans from constructing buildings, parks and road. This preserves the land from sliding and falling away into the ocean. Local Aboriginal people go into mangroves to hunt and gather bush tucker and bush medicine such as periwinkle, clams, longbums, crabs, mud lobsters, mangrove worms and parts of plants to eat for food and health. The shops don’t have these traditional foods even though the foods are important to Aboriginal culture, so hunting and gathering is an important tradition that must not be lost. My research has shown that we can raise awareness and be sustainable to save our mangrove forests through entrepreneurial programs. To raise awareness about mangroves, mangrove tours for everyone could be offered by Darwin City Council, Northern Territory Parks and Wildlife and local Aboriginal people and organisations. The tours could be in and around the mangrove forests. Those that would be interested in these tours would be students and teachers, tourists, locals who want to find out more and the fishing companies. Tourists that come to the area will enjoy learning something new and something different. Big fishing companies should support saving the mangrove forests by working with environmental groups. They can do this by giving them funds, volunteers, education or experts to host mangrove sessions and raise awareness of why mangroves are important. They should also help existing mangrove forests and plant new ones. Fishing companies should do this because they will get more fish from the mangrove nurseries and have more products to sell which means they will have more customers buying their products and create more profits for the company and local economy. Furthermore, wood from mangroves can be used to make furniture, sculptures and carvings, building materials, dyes for leather and fabric and fishing products among other things. This could help the local large and small businesses and economy with unique, different and new products. My research shows that mangrove forests are needed because they provide a food source, a natural barrier against cyclones and tsunamis, a habitat and nursery for fish and protect the coastline. They are also an important part of local Aboriginal culture. Protecting the mangrove forests can be good for big fishing companies, the local building industry, local population and businesses, tourism and the land if used sustainably. Darwin City Council information boards at the Mangrove Boardwalk, East Point, Darwin. Nicole Kay - Teacher at Ludmilla Primary School. David Percival - Mangrove Activist. Caramalita – Aboriginal Salt Water Woman from Tiwi Islands.